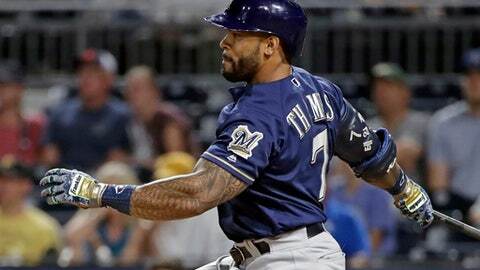 PITTSBURGH (AP) Milwaukee outfielder Eric Thames left the Brewers game against the Pittsburgh Pirates on Friday with right hamstring tightness. Thames suffered the injury while playing a ball hit into the right field corner in the top of the second inning. He was replaced by Hernan Perez. Thames finished the game 0 for 1 and is hitting .250 on the season with 13 home runs and 28 RBIs. It was the 14th start of the season in right field for Thames. He’s also started 21 games at first base and five in left. He has received more playing time in the outfield thanks to the emergence of All-Star first baseman Jesus Aguilar.